The process of planning a MOOC can be a whole project in and of itself. For CLMOOC, the facilitator team was very involved in the planning process. For many weeks before the MOOC started, we had weekly web meetings in Google hangouts to plan the MOOC. We also used Google Docs extensively to record our meetings. In these meetings, we talked about our goals, our ethos and guiding principles, how we’d divide the work, and many other issues. We spent a lot of time planning…really, a lot of time, but in hindsight, we think it’s one of the things that made CLMOOC successful. In this ongoing series on hindsights regarding #clmooc, I think that one of the most important elements of our success was the team. I believe strongly that active facilitation is critical to cMOOC success. Those that have weak or nearly non-existent facilitation do not often thrive. This is, of course, a challenge of time, commitment, and sometimes budget, but it is essential. In this regard, #clmooc soared. The team for #clmooc was in a word, amazing. There were many ways in which this team was assembled and then worked together that contributed to our success. There were seven of us. That may seem like a lot, but I know that we couldn’t have done all the work we did with a smaller team. It was the right number for this project. Not so many that we couldn’t really get to know each other and meet together frequently, but enough that we could plow through a huge amount of work. Each week, two people had primary responsibility for that week’s activities. One was the lead, and one was the helper. But everyone contributed every week in amazing ways. We had a streamlined system of consistent activities that we developed together. We started each make cycle with a blog post and newsletter. Each week we had a “Make with Me” hangout and a Twitter chat. We participated in Connected Learning TV webinars and #literacies chats. We ended each make cycle with reflections, sharing, and Find Five Friday. We planned and planned and planned. 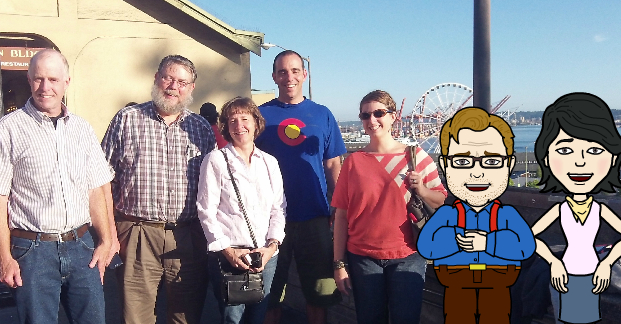 We met via Google hangout online every week for many hours before #clmooc began. We produced what seemed like hundreds of Google docs. We talked and talked and talked. And #clmooc was better for it. Our team made everyone in #clmooc feel welcome and feel that however and whenever they participated was ok. If someone joined in Cycle 6 and was just starting with their introduction, we made sure they knew that was just great. Several participants said that this stance really helped encourage their participation. Our team worked hard and was always present. As Terry said, it was a rare hour in the day when one of us wasn’t online in the community doing something. We spanned various time zones and had different times when we were able to jump in. And we posted and talked, tweeted and hung out, encouraged and reflected, 24/7. We had shared values and a commitment to excellence. And then there were the individuals themselves. Elyse Eidman-Aadahl, Paul Oh, and Christina Cantrill brought bold and bright leadership. They had a vision, but also asked the team to bring our own vision to the project and to build out whatever new tools and ideas we had. Most importantly, they empowered us to be our very best as a team. We were given not only chances to use our voice at every turn, but also admin rights and lots of support, which was a huge part of #clmooc being what it was. Joe Dillon reminded us at every turn that however participants took part was good and acted as a voice of encouragement. I will forever hear his strong, comforting voice saying “Karen, you are ok, and however you participate is ok.” He consistently reminded us that there were all kinds of people in the MOOC and that we should keep them all in mind as we proceeded. #clmooc was a better place for his leadership. Anna Smith joined us from a different locale each week and asked questions at every turn that took us to new points of departure. She brought clarity to us through these questions. Anna also prompted our noticing and sharing with Find Five Friday (#f5f). Kevin Hodgson – ah, what a force of nature he is! Kevin made movies, made music, wrote posts, made makes, and much more. His words, pictures, thoughts, and feelings inspired and delighted. I will be continuing to catch up on Kevin’s prolific output for months to come. I feel lucky to have Kevin as a friend. Stephanie West-Puckett helped us to understand and bring the Connected Learning principles and ethics into everything we did. She also brought the playful lightness of toys and children into #clmooc. I always felt that Stephanie was there to help boost me up when I fell short and for that I am grateful. There is nothing like feeling you have someone strong there for you when you need her. Jordan Lusink kept us organized and smiling! She performed many, many behind the scenes tasks that supported us, and #clmooc couldn’t have been without her and her team. And of course, there was the community. There are too many to name, but so many of you took on leadership roles. That, to me, is the true proof that we achieved a vibrant peer learning community where we were all facilitators, all teachers and learners. For me, that was one of the biggest successes of #clmooc. Thank you all for a truly great summer of making and Connected Learning. I appreciate each of you deeply.